It has been such a busy summer with strong interest in properties outside of Fort Nelson ... notably Atlin. However, whether in Fort Nelson or in Atlin, many home buyers look at the home they are considering purchasing and also consider the improvements that are needed. Do you know that you can get both the mortgage and the required improvements for as little as 5% down without having to stretch your bank account to make those needed renovations or, worse yet, use your charge card. Do it all at once ... and have the home that you want. FORT NELSON – Two more suspicious fires have been lit by unknown persons over the past weekend. 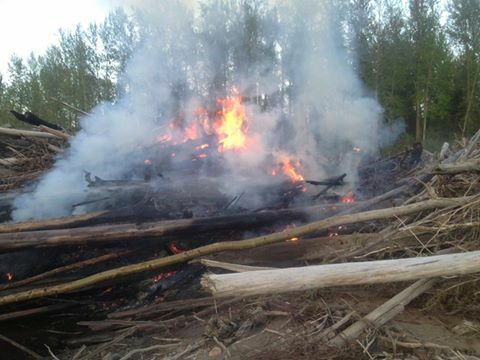 At approximately 20:00 hours on Friday, May 13, 2016 a call was received by Northern Rockies Fire Rescue regarding a fire in the log pile along the Muskwa River near the Highway 97 bridge crossing. “This fire appears to be deliberately ignited using a petroleum product” informed Fire Chief Gord McCleary. “As we worked to suppress the fire and prevent spreading, we could smell petroleum burning”. At 06:00 hours on Monday, May 16, 2016 a fire was reported in the grassy area between 53rd Ave W and 52nd Ave W. This fire was approximately 200 feet in length on the hill behind the Springhill and Hillside Apartment buildings and adjacent to the hospital. “I am asking everyone living in or visiting the NRRM - BE EXTRA VIGILANT AND OBSERVANT. We all have a part to play in helping to prevent fires. • Campers – Please ensure your fires are no larger than 18 inches wide by 18 inches high to reduce sparks and the chance of an uncontrolled fire. Ensure the fire is completely out by dousing it with water repeatedly until it is cool and fully extinguished. On behalf of Regional Council, we thank you for your cooperation". Both fires are under investigation by Northern Rockies RCMP and files have been opened on each incident. Inquiries and investigation is ongoing as RCMP follow up on some potential leads. If you have any information on the above two fires or if you see any suspicious activities, please call the Northern Rockies RCMP at 774-2777. For reporting of smoke or fires, please call Northern Rockies Fire Rescue at 774-2222. Angels overhead on the community trail at 5 am today ... heralding a stunning day! 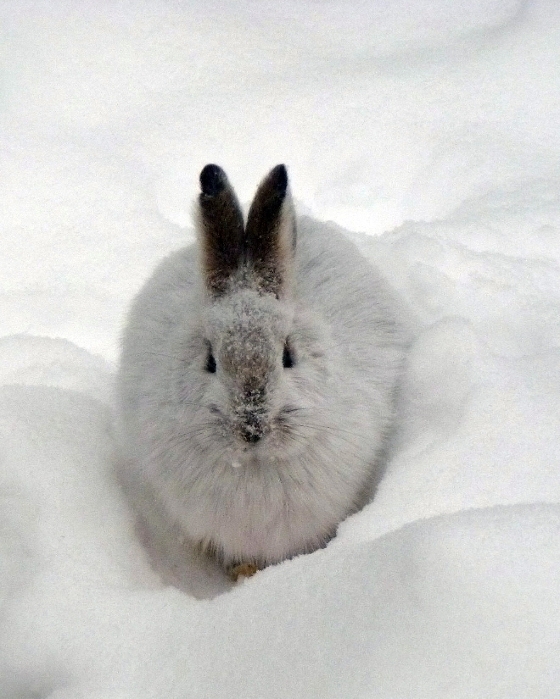 HAPPY EASTER ... enjoy the warm temperatures and sunshine with family and friends. Spring is just around the corner! One of the recent Americans had, what appeared at the time, an almost impossible "wish list" as to what he was looking for in terms of a property ... the type of property that one could spend years trying to obtain in this area without success. I explained to him, in detail, how most of our land up here is owned by the Crown and much of it protected as in the case of the Muskwa Kechika. I did offer him two possibilities that did not contain much of what was in his "wish list". However, after much thought I remembered that I did know of a property that met that list. I just didn't know if the owner would even consider selling as it was a rare find for him, a property that has never been on the market and that few know about. Lo and behold ... he would consider selling. Needless to say the American was over the top with excitement. 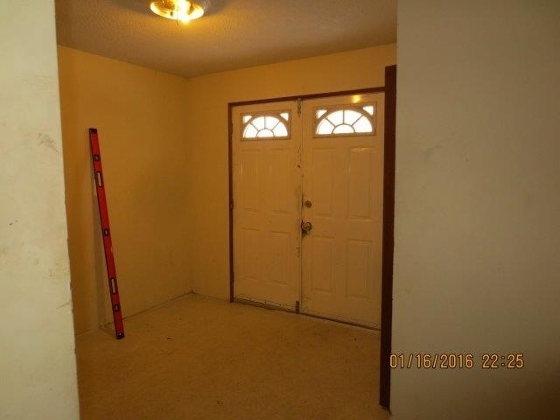 He had considered hundreds of properties and nothing met his "wish list" until now. He had found my website and had enjoyed reading my biography. Based on that he decided I was the realtor he wanted to deal with. His decision was further strengthened when he received my emails outlining the rarity of properties such as he was seeking, the history and background of the area and the information that much of our land is protected so that the public may enjoy it. When I sent him an email with the information of the property that I had located he immediately picked up the phone and called me, he was so excited. Deal is not yet together and it will no doubt take some time considering the issues he will be facing .... but just receiving his call outlining how he had chosen me and his delight with my service makes it all worthwhile! With our falling dollar I have been receiving an unusual amount of inquiries for a variety of properties from potential American buyers. If you have a recreational property that you may be considering selling, now may be the perfect time. Call me! There is nothing more exciting than having a buyer who can envision how a poorly designed and neglected home can be improved with well thought out renovations and with good quality materials. The buyer of this home can see how this can be turned into a high quality home where most simply wrote off the potential. This buyer always has incredible vision and the capabilities to turn that vision into reality. I am looking forward to seeing the finished product! In today's market there are so many potential projects for those with the vision and abilities! We have a fabulous walking trail that winds through the woods and our town does a good job of keeping it clean. There is someone out there enjoying the trail at all hours. 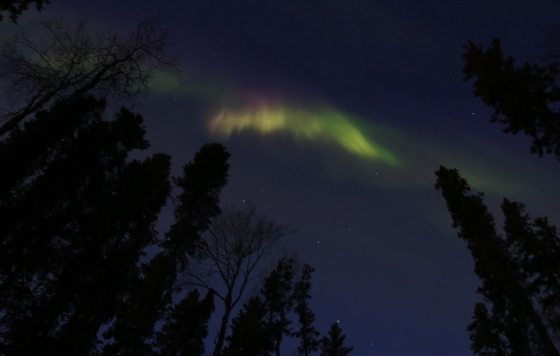 Early this morning and even after 8 am, there was a spectacular light show to be enjoyed while walking! For those who regularly venture up highway for an afternoon drive, a hiking trip or a weekend camping trip outhouses are an ongoing concern. At Monday's Regional Council Meeting the decision was made to de-commission the outhouses at Steamboat and Allen's Lookout and entering into agreements with various operators along the highway to provide facilities for the public. The nearest facilities will be Tetsa River Services, Toad River, Double G and the Liard Hot Springs Lodge. I venture up highway often and am aware of the number of truckers that overnight at the Steamboat brake check as well as the number of travellers who stop solely to use the facilities. I know the truckers are regulars at Toad River and Double G but have a hard time seeing those truckers pulling into Tetsa River Services. Shall be interesting to see what the Steamboat brake check will look like after a few months of no facilities!!! Considering that Alaska Highway news has this story and the info is on their website, this is something that is accurate and you may be interested in reading. Having been away and driving through the various communities along our highway I am always struck by the beauty of our modest little community that greets the traveller as they come into town. We have to be proud of the lights, both festive and the ones that remain all winter .... or in other words, during the darkness! No other community along our highway offers such a festive and welcoming sight! Fort Nelson ... the street where we live! An informative council meeting last night with Director Soles giving a well prepared and thoughtful opinion to the other members of the NRRM Regional Council regarding the local forestry situation followed by several strong motions that were fully supported by all Council members expressing concern regarding the proposed movement of local logs to Fort St John and the continued control of our local timber supply by Canfor. 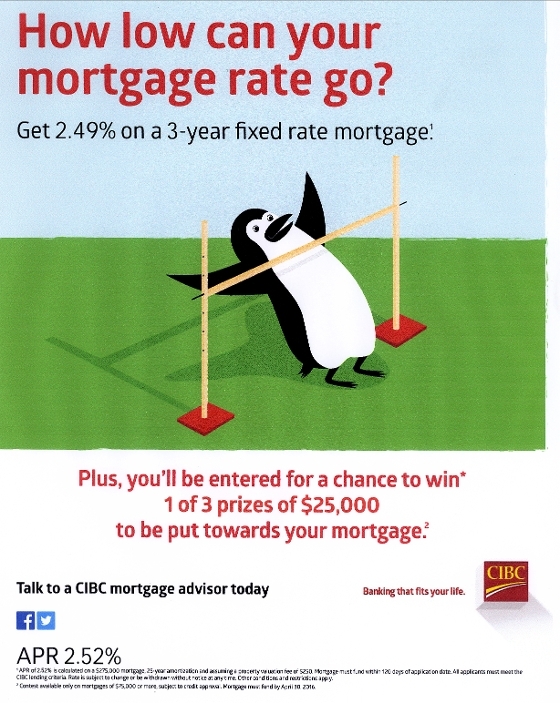 Our local CIBC manager, Debbie Coventry, asked that I make you aware of this great financing offer for your new home. With the prices at their current level, and financing availability, now is the time to buy! Interesting ad in yesterdays paper ... looking for truckers to haul logs from Fort Nelson to Fort St. John. Our economy certainly can use a boost but noticed that they aren't advertising for others in that industry - and the logs are going south! On Monday our Mayor, Bill Streeper, presented Deputy Fire Chief James Childs with the Canada Fire Fighter's Service Medal for 20 years of exemplary federal service, all of which has been dedicated to Fort Nelson and Area. Well done James ... and so nice to see the Council Chambers filled with his very proud family. When I came to town, January 1 1990, there were no traffic lights other than the crosswalk. Today, we are a 3 light town - it appears the third set of lights at the Recreational Complex are now operational so be careful and aware. Do not breeze through a red light as you head into or out of town! It is that time of year that you really should make sure to check and replace your furnace filter ... a clean filter will make your furnace run much more efficiently. I change my regularly but am always amazed how dirty they get in this country. Yesterday I had one in a building that I am marketing that really jogged my memory to remind people .... it was absolutely filthy. They are out of sight and so naturally out of mind. While you are checking your furnace filter, take a look at your carbon monoxide detector. The life span is no more than 10 years. I confess mine was somewhat older when I got reminded to check mine! I immediately replaced it! This is a letter that my great grandmother received regarding her son Idion (the man seated in the previous post). My father was born after this and he carried his uncles name. This is always a time for reflection. I very much regret not being able to write you before this, but for the past two months I have been on my back with a severe wound and only now in a position to write. I am, or rather was, the commanding officer of the company of which your splendid son was a member. Probably he told you of him having fun with me in the 10th Battalion and then later coming with me to the 3rd. There never was a better soldier and I was greatly pleased when he decided to stay with me when I transferred. You knew he was my own special runner and right hand man generally and it is only the very best and most reliable who are chosen for that duty. On the 10th of October our company was supporting the 55th Battalion wo were attacking at Paschendaele. We had only a small narrow trench to protect us from the endless shelling which was a perfect hell. In a short time half the company were casualties. As soon as we arrived at this position, the first thing your son did was to dig a bunk hole to protect me. He then dug one next to it for himself but would not use it until he had done everything he could for me. A little later I was called away and a shell hit my bunk hole and exploded. the pieces hitting your son on the side. He was immediately attended to and carried to the dressing station. After being dressed there he was sent on to the next station, for there can be very little done at the advanced station. He lasted not long, however, it may be some consolation to know that owing to unconsciousness, he did not suffer. We went over the top together at Vimy Ridge on April the 9th and, when I arrived at our destination, there was your son with a smile on his face as though nothing had happened, although we had gone through an awful time. If there is any further information I can give you, please let me know.